I'm sorry for my absence...April has been a crazy month! Between submitting my thesis, traveling, and getting ready to move to Chicago, I've barely had time for even grocery shopping! One thing that's been keeping me busy is a final project for my global policy class. My group's theme was "health" so we had to write a policy paper on a global health subject. We decided on the issue of the growing rate of obesity since it is surprisingly not just an American problem. As people in developing countries are adopting a more "American" lifestyle (i.e. personal cars, fast food, watching TV), they are becoming more overweight. The huge increase in the rate of obesity in just the past 20 years is really alarming, look at the map to the right from the CDC. In 1990, the rate of obesity was less than 15% in every state, now its nearly 30% in a quarter of states. Obesity does have many genetic factors but it is still a personal and society decision, for the most part. Obesity is considered a disease and will likely reach the level of a full global pandemic by 2030. As in, on the same level as malaria or influenza. But obesity is not a communicable or infectious disease and it is very much preventable. Obesity won't usually kill you directly, but it is much like smoking in that it increases your risk significantly to other diseases, primarily heat disease, cancer, and diabetes, which will lower your life expectancy. So what can we do about the obesity epidemic? You can start with making your own personal choice to stay at a healthy weight by learning how to eat healthy and by being more active. There are some other initiatives out there, like Jamie Oliver's Food Revolution to get better food into schools and Michelle Obama's Let's Move campaign to get kids to start being active again. 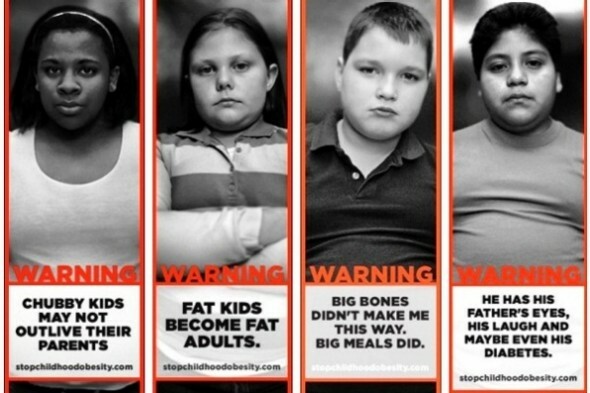 There's also Georgia's childhood obesity campaign (pictured below) that seems to be kind of extreme and offensive. I think we should be targeting the parents and not the kids. My team for my class decided to propose a "sugar tax" as part of our project. This has already gained some conversation in Washington and France just implemented a sugar tax on sodas. Our diet has way more sugar than it did 50 years ago and excess sugar clearly leads to excess fat. Sugar is also easy to target because it's added to many processed foods. Do you think that a sugar tax would be fair? Coca Cola was pretty mad about it happening in France. And what about farmers and exporters of sugar and high fructose corn syrup? But sugar has toxic effects other than just weight gain. Watch this video from 60 minutes. We heavily tax tobacco because it is unhealthy. If soda were 30 cents more expensive, would you still buy it? Many Americans would probably still drink soda and buy foods with sugar. The good thing is that a sugar tax would bring in money to the government. Our team proposed that we could use this money to in turn fund grants for employers to offer healthy lifestyle benefits to their employees. For example, a business could apply for a grant to reimburse employees' gym memberships or even build a small gym in the office. Still, this would not guarantee that the employees would become more active. The obesity epidemic is growing rapidly and I think its going to be interesting how we deal with it in the near future. Will fast food chains become as shunned as the tobacco industry? What are your ideas about how obesity should or will be dealt with? Great post Lenka!! Wow to Georgia's campaign, those photos were definitely disturbing. I'm curious what other influeners contribute to the rise in obesity other then the type of foods available. For instance, longer work weeks, greater levels of stress among individuals, increase in divorce rate causing limited time for parent to cook...Thanks for posting it is a growing problem that needs to be addressed. Thanks Jennie! There are definitely a lot of factors contributing to the rise in obesity and they are all societal factors which is why we need to address them as a society. The obesity epidemic is often compared to smoking in terms of costs but I think it is much more complicated. There isn't one specific industry or activity to blame. How we deal with obesity is going to be interesting! Lenka, I totally agree. It's more about what we take in than how active we are, even though activity is important. We need a soda tax, and a tax on anything with say higher than a certain percentage of sugars. Candy should not be cheaper than something substantive. Pop and candy machines do not need to be in the schools at all (but what about those lucrative Coca Cola contracts? ).